Thunderbird—created by Mozilla, the organization behind Firefox—has been a popular email client with a loyal following over the years, despite threats of halting updates and further development of the application. While Mozilla no longer supports Thunderbird, it still remains a powerful app with a robust library of add-on features that allow for full customization of your email experience. While some may enjoy the added functionalities, others may find this difficult and complicated to set up. Also, Thunderbirds interface may not be as user-friendly as other email clients out there, including those that have just as many (if not more) advanced features. 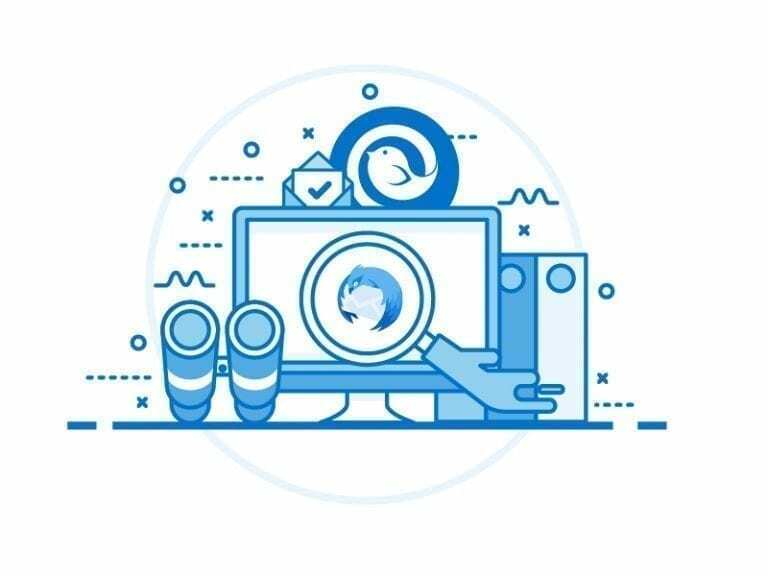 For these reasons, you may be considering alternatives to Mozilla Thunderbird. 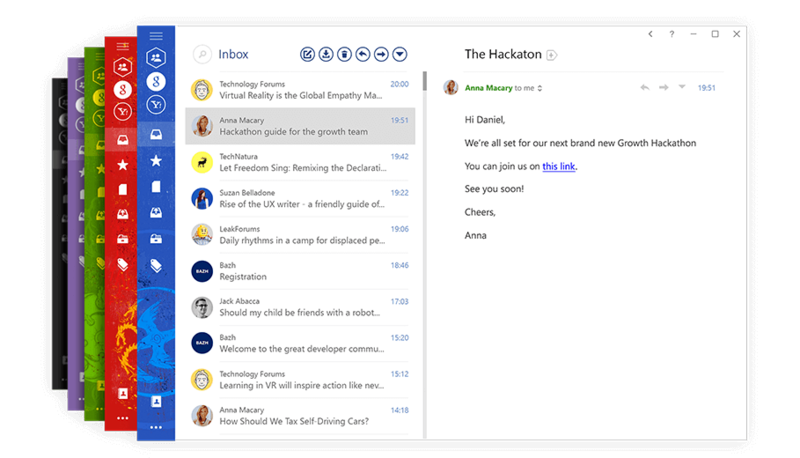 Whether you’re looking for an entirely new email client or switching from Thunderbird, we’ve compiled a review of five Windows options below to evaluate instead of Thunderbird. Since Thunderbird is a downloadable program for PCs and Apple OS, we won’t be including mobile apps in this review. 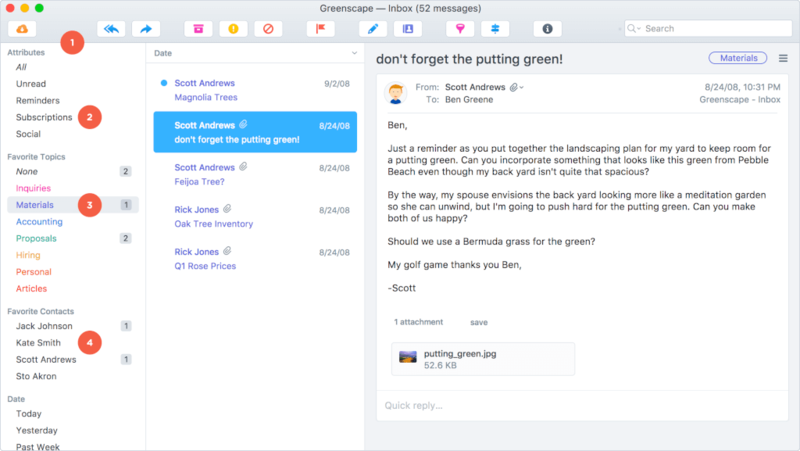 Mailbird is a relatively new email client that has quickly developed a reputation for being a powerful, feature-packed application that’s beautifully designed for a quick, easy user experience. Set up is simple and it only takes 5 minutes to learn how to navigate the app. You can also customize your layout and color theme to design an experience that’s ideal for you. The reason Mailbird has become the top alternative to Thunderbird is the many third-party app integrations. Users can connect Mailbird to Facebook, Twitter, WhatsApp, Google Drive/Calendar/Photos, Dropbox, Evernote, Asana, Veeting Rooms, and a whole host of other apps. This level of connectivity turns Mailbird into more than just an email client—it’s an all-in-one communication platform. Beyond this, Mailbird also has many email features worth mentioning: You can sync multiple accounts from any provider with their Unified Inbox, which was just upgraded with color indicators for easier navigation and email management. The snooze function allows you to snooze emails and contacts until a later time that suits your focus better. Inline reply automatically formats replies with a name and color, so you can respond directly in messages. These are just a few, there are so many more! If you’re looking to increase productivity and communicate more effectively, Mailbird is the way to go. Mailbird vs Thunderbird. Give it a free try now. 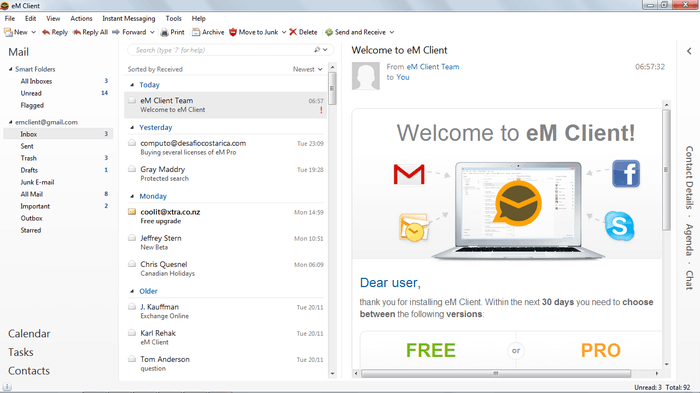 eM Client is another highly-rated alternative email client to Thunderbird. Users praise its simple design and user-friendly interface that allows for customization of layout and theme. It offers the most features for free compared to other options; the only differences are that the Pro version lets you connect an unlimited number of accounts and includes tech support. The free version only supports two email accounts. Migrating to eM Client is quick and easy, and it can transfer your messages and contacts from a variety of common other email clients, including Gmail, Exchange, iCloud and Outlook.com. It also has a real-time chat function for instant messaging—you can even send attachments through it! Some other notable features include automatic translation of emails, a fast search function, and encryption options. Postbox is one of the easiest-to-use email clients on this list. It works with any POP/IMAP account, including Gmail, Hotmail, Yahoo, and more. Once you’ve added your accounts, you can group them, in “personal” and “work” groups for example, to keep your email organized. The application’s filtering and tagging features allow you to get even more organized—all on a beautifully designed interface. 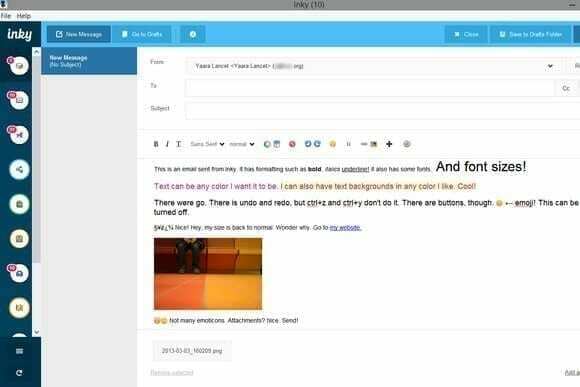 You even have emoji support, 25 email signature templates, and 70 professionally written email response templates at your disposal. It’s important to note that Postbox also includes a number of integrations with services like Evernote, Slack, Todoist, and more. Inky is a great alternative to Thunderbird that simplifies email management and organizes your inbox. Users can quickly set up Inky with the username and password from their email addresses. It’s best for personal use, as it lacks some of the advanced features that a business user might appreciate, but you can definitely use it as one location to track all of your emails (whether work or personal). Inky attempts to sort and filter your emails, so that you see only what’s most important to you in a clutter-free user interface. That’s how it keeps your inbox organized and allows you to streamline email management. In any assessment of an email client, web mail is always worth mentioning. What do we mean by web mail? Gmail, Yahoomail.com, Outlook.com (not to be confused with the Outlook APP) are the most popular options. Most email providers have some sort of web-based email offering that have a few advantages over email applications. Most importantly, you can access your inbox from any computer and on any browser. You don’t need to download an app to your computer. On the other hand, you cannot access your email offline and web-based email clients don’t typically have as many features as desktop apps. It will be important to weigh the benefits and drawbacks of web mail against your needs before deciding to go this route. Whether you’re a current Thunderbird user, or someone considering Thunderbird but interested in your other options, there are many viable alternatives to Thunderbird. If you’re a light user, Postbox, Inky, or even web mail might be the best choice. For more advanced users, consider Mailbird or eM Client. At the very least, it can’t hurt to try a few options to see which one you like the best! Did we miss any popular alternatives to Thunderbird? Let us know which ones you prefer in the comments! Declutter your email with the best alternative to Thunderbird. 25 thoughts on "The Best Alternatives to Mozilla Thunderbird for Windows in 2019"
There is no need switching to Postbox – the code base of Thunderbird is still up to date (based on Gecko 38) and not 27 versions behind (AFAIK Postbox is based on Gecko 9.0). And development of Thunderbird is ongoing, and will be for the next couple of years, so I really don’t see why you would be looking for alternatives right now? I am with eMClient. Does the job really well. Thunderbird development is still alive and the number of users is still growing. Thunderbird is the most secure and best messaging software, no raison to switch to another. Outlook ??? It’s a joke ! Mmmmm, could be your server, or junk mail piled up on your computer…….or any number of things. I don’t understand why Mozilla doesn’t see the unique value of Thunderbird. I use 5 different browsers in Windows and Android, and for what I do, they are all pretty much interchangeable. If Firefox disappeared, I would miss it very little. But no other email client compares to Thunderbird in terms of versatility and extensibility. Why does Mozilla focus all it’s attention on a commodity product like its browser, while neglecting a truly unique and useful product like Thunderbird? If it’s money, I’ve said many times I would pay a montly subscription service fee for Thunderbird. The best email client for IMAP poweruses is TheBat. Insanely fast, too. what are these ‘resources’ all doing at Mozilla. Firefox is crap, TB is the only thing worth their time right now. I wish they merge Thunderbird in Firefox just like Opera. I want to download Thunderbird am disappointed to read this as seems a way better system. Will I be ok and updated downloading TB as I see most comments are year old.I have windows 10 ? I’m willing to bet some other organization will pick TB up and keep it going. Sadly, it might be someone might turn it into freemium or fully pay based software. I hope not that, but I do hope it gets picked up by some open development gurus, maybe some of the FireFox people who worked on it under them…I don’t know. Been trying to find out my passwords for Thundbird for months. Just can’t get to it. I follow instructions, but it’s nowhere to be found. I have to stop using TB because I can’t use it for my gmail account. Never had this problems many versions in the past. Nice job ‘improving’ with each version you effing morons. I have been having problems with my passwords also. It’s not your server or you it’s Thunderbird they periodically cause the passwords to fail. They won’t recognize them as valid. Today I had all of my email passwords fail which is heartbreaking because my life is on there and it was so nice to go to one place to get all my emails. It’s pretty sad that they are using tactics like blocking passwords to try and get people to move on their own and then blame it on the servers. I am in search of a service like Thunderbird which is how I found this page. I loved Thunderbird until TB 60 came out. They’re making every theme worth using incompatible, especially the complete themes which make it so much easier to use. If they had to get rid of them, the least they could have done was provide more options than a solid white or solid black theme or the default which is white too. The screen is so darn boring now that I nod off when checking my emails. TB needs to allow complete themes or create some decent ones themselves or they’re going to lose a ton of users. Thunderbird is great. Maybe some of youse big-time “power-users” need something better but for your average Joe it works just fine. I been using it for years with NO problems at all. Lucky me, eh? Good summary of alternatives. Thank you. I checked this site because TB is behaving oddly. After update 2 days ago spellcheck now identifies a huge range of regularly used words as ‘mis-spelt’; words like actions, customers and so on. Most ‘errors’ are simply plurals, but not all. I have tried to log on to Support but get password error. Have requested reminder of password and entered my regular email address but although it says ‘reminder sent’, nothing arrives. All very frustrating. Apologies for this minor rant! TB had been great for many years and entirely trouble-free until now. Hi, please write us at [email protected] – we will be happy to help. There seems to be no mention of security in any of these suggestions. When you are providing an email client the credentials for your email accounts it would be good to know the security policy. of course you could go to each client page and look it up but it just seems like something to consider when recommending something like a mail client. Mailbird is crap. It’s not ready for public sale yet. You can’t even sort by columns. You can’t even HAVE columns. Do NOT throw your money away on this garbage.